This delicious and easy gluten-free recipe can be frozen until you're ready to eat it. This delicious and easy gluten-free recipe can be frozen until you're ready to eat it. In a medium bowl, combine cauliflower, egg, mozzarella and all desired spices. Press evenly on baking pan or pizza stone. Bake at 450 degrees for 12-15 minutes (up to 20 minutes if you double the recipe). You may turn over once if desired. Place under broiler, on high heat, until cheese is melted. Pizza crusts can be frozen after the initial baking and used later. *If using frozen cauliflower, prepare according to package directions. After cooked and slightly cooled, shred cauliflower with a cheese grater, (or grater blade on food processor) and then measure for the recipe. (An "unpacked/loose" cup.) Be sure to drain WELL. 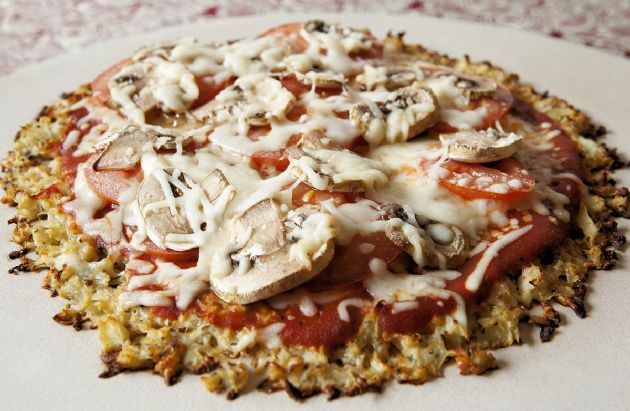 Guestimate~Approximately 2 1/4 cups of 1" cauliflower would grate into one cup of grated (or riced) cauliflower. For lower calories, substitute two egg whites for whole egg and low or no fat mozzarella cheese. Don't spread this too thin or it will fall apart; if it's too thick, it's doughy in the middle. Please share your personal experience. (1.Did you use fresh or frozen califlower? 2. Or try both? 3. What size did you make the pizza? 4.How long did you cook? 5. How thick did you make the "dough"? 6. Was the texture smooth or lumpy? 7. Did you add extra egg or find you didn't need to? 8. Were you able to hold in your hand or too soft to do so?) Any one of the aforementioned, by number or just anything "helpful" to others. Maybe I should change "using frozen cauliflower" directions. Cooking first may be producing a too moist (unsatisfactory) crust. Thanks for posting your experience, BGKOZDRAS. Cooking longer, (maybe lower heat, as another comment suggested) using cast iron skillet and flipping are great tips for achieving crisper crust. Thanks for posting and sharing your experience and enjoyment of "the perfect name for a perfect GF crust", hmitf! Do you use fresh or frozen cauliflower? Do you cook frozen or just defrost and drain? Great idea to make individual English muffin sized pizzas! Thank you for sharing VEEGEE! Nice detailed specifics; appreciate you for sharing your wonderful experience with everyone, Coleygreene! Use of a baking stone and cooling to achieve a better bound crust...both appreciated ideas. Thank you WBS9! Did you use fresh or frozen, raw or pre-cooked cauliflower? Mmm...sounds delicious. Great additional seasonings; they make a huge impact on the crust personality! Makes me want to add fresh raw items to your experience....pineapple slices, gingered pears . I have three families coming for Vietnamese Chicken. Think I'll add this "bread" to the menu. Loved this. We even liked it without any toppings! I used Italian spices & powdered garlic & a little dried minced onion.. Will be making this again. definitely on the menu for this week! great way to get more veggies into the meal plan. Good, We changed up the seasoning and made bbq chicken pizza... not thin & crisp like I prefer, but I'll work on it - could be I didn't bake it long enough because I feared burning the bottom of the crust. This looks good enough even if I wasn't gluten free.